Prevent damage to floor edging while providing smooth traffic transitions with Schluter®-RENO-T transition profiles. RENO-T is installed within the existing joint cavity, overlapping the adjoining flooring material. Designed for transitions of equal height, hard surface flooring. RENO-T is available in 17/32" or 1" widths to accommodate different size joints. The profile is available in stainless steel, solid brass, and anodized aluminum. 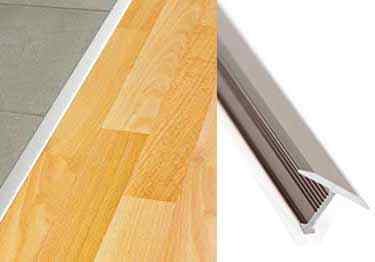 For transitions of existing, equal height hard surface flooring applications like ceramic tile, natural stone, laminate, parquet flooring, concrete pavers, etc. How high is the 1" wide T molding? I need a product that's 1/2" high (for a boat flooring project). Thanks.